Torrential rain yesterday and overnight in the Cloncurry area following yesterday's widespread rain led to rapid rises in NW QLD rivers today. Cloncurry Airport recorded 152.2mm in the 24 hours to 9am, while Cotswold Station, 50km NNE of Cloncurry down the Cloncurry River recorded 196.2. The River rose rapidly, peaking at Cloncurry at 6.2m this morning, 0.8m below major flood level. Other rivers flowing to the Gulf, the Nicholson, Gregory and Leichhardt, were in minor flood in their upper reaches. 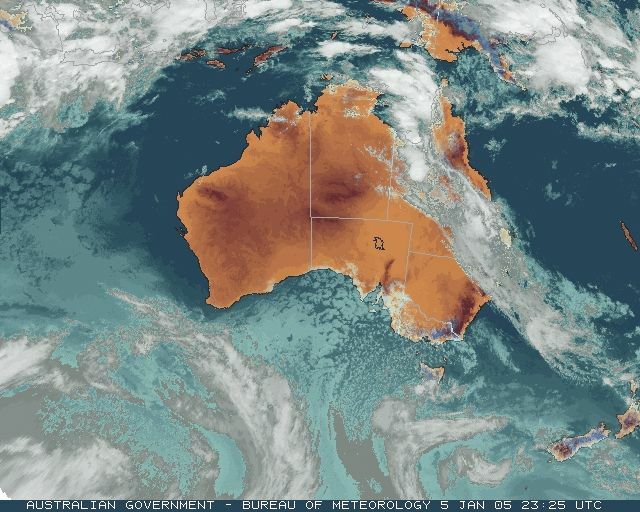 Rapid rises were also reported in the Georgina River, which flows towards Lake Eyre. Urandangie, in the northern headwaters of the river reported minor flooding, while the river was also rising rapidly at Marion Downs, about 250km southeast and below the junction with the Burke River which flows in from the Boulia area. As the maps at right show, both overnight and daytime temperatures were well below average across an enormous area of inland Australia today. 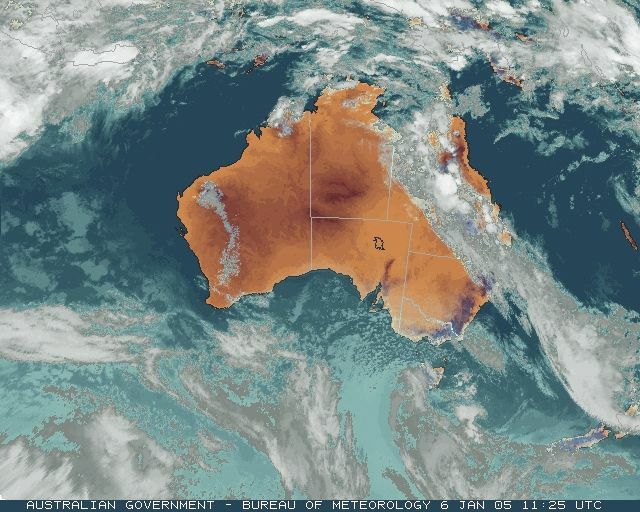 In the NT, Brunette Downs on the Barkly Tablelands in the east and Ali Curung, in the central Teritory 150km S of Tennant Creek, set new December lows. In a curious anomaly, Boulia's minimum temperature for the 24 hours to 9am this morning of 16.2, 8.2 below average, occurred at midday yesterday -- one wonders how many times an Australian Outback station has recorded a minimum temperature 8 below average in the middle of the day! 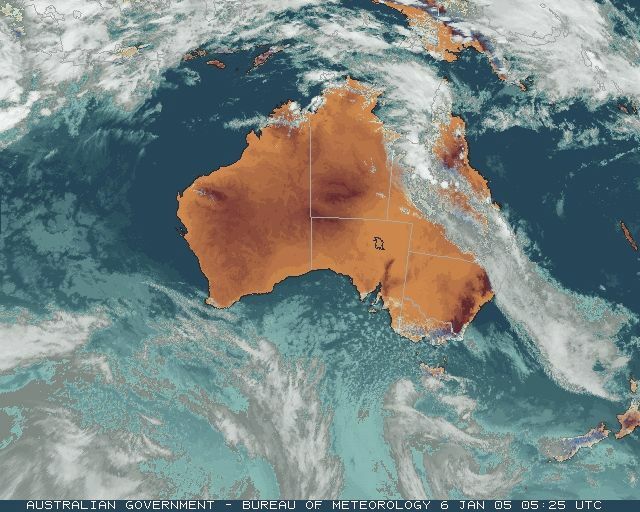 A trough that moved very slowly across central eastern and SE QLD today brought some substantial falls from rain areas to the southeast, but, unusually, no thunderstorms. The mostly gentle rain was welcomed by farmers. Goomeri, 60km W of Gympie, topscored for the 24 hours to 9am this morning with 92.0mm, but most other falls were below 50mm. Rain continued through the day, giving many totals above 50mm for the 24 hours to 9am Friday, about half of which fell today, Thursday. There were some bands of heavy rain this afternoon and evening which stand out in the downpours report, including 26.6mm in half an hour at Double Island Point and 35mm in an hour at Toowoomba. TAS was squeezed between a 991hPa low just to its south and a 1022hPa high in the Bight today, guaranteeing strong winds. The long southward ridge projecting from the high also ensured they would be cold winds. 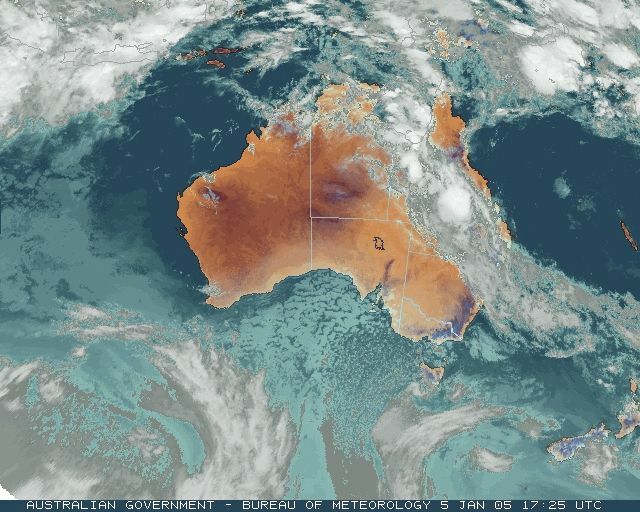 The temperature maps show that well below normal overnight and daytime temperatures occurred over all southeastern states, while the wind gusted to 111km/h atop Mt Wellington. In a reminder that winter clothing must be taken on all mid-summer bushwalks in TAS, the AWS on Mt Read, in Tasmania's moutainous west, reported an overnight minimum of 0.0C, with 36mm in the gauge and a 24-hour average windspeed of 28km/h, meaning also that snow is likely to have fallen in the higher parts of the state. At least six bushfires burnt around Perth in near-40 degree heat and blustery winds, most of them believed to have been deliberately lit. North of the city, the Yanchep National Park was evacuated as firefighters battled two blazes, while another big fire was threatening property at Eglington. Other fires were burning at Whiteman park east of the city, and in the suburbs of Kwinana to the south. These records are as received at 1023 EST on 05/02/2006. Help in interpreting these statistics and information on quality control is here.